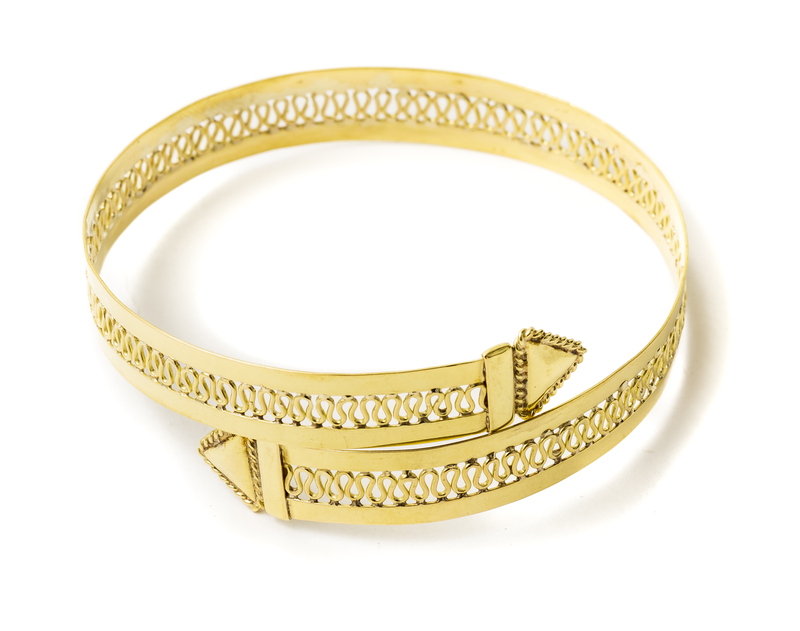 The elegant spiral-wrap band bracelet is characterised by graphic lines and see-through effect created by the coil-shaped gold-threaded motifs. 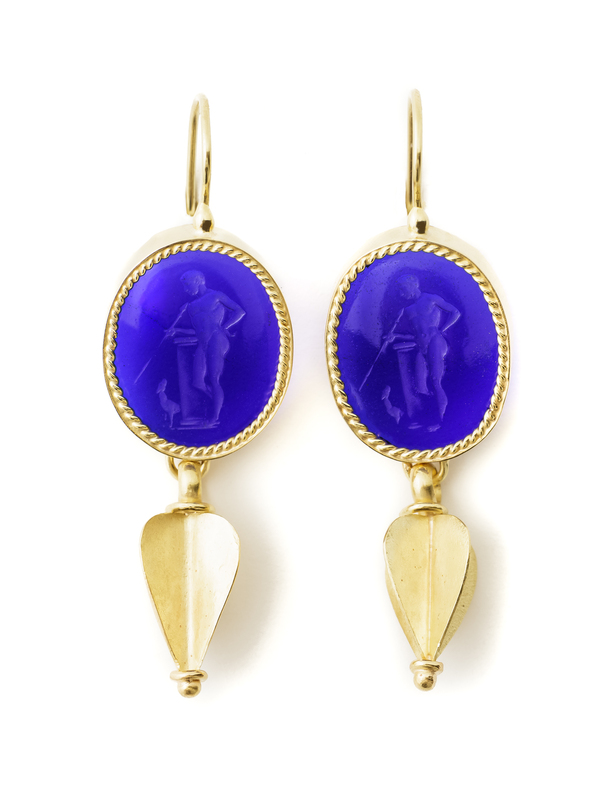 This pair of elegant gold earrings are of the finest form, with cobalt blue carved vitreous paste and pendant. 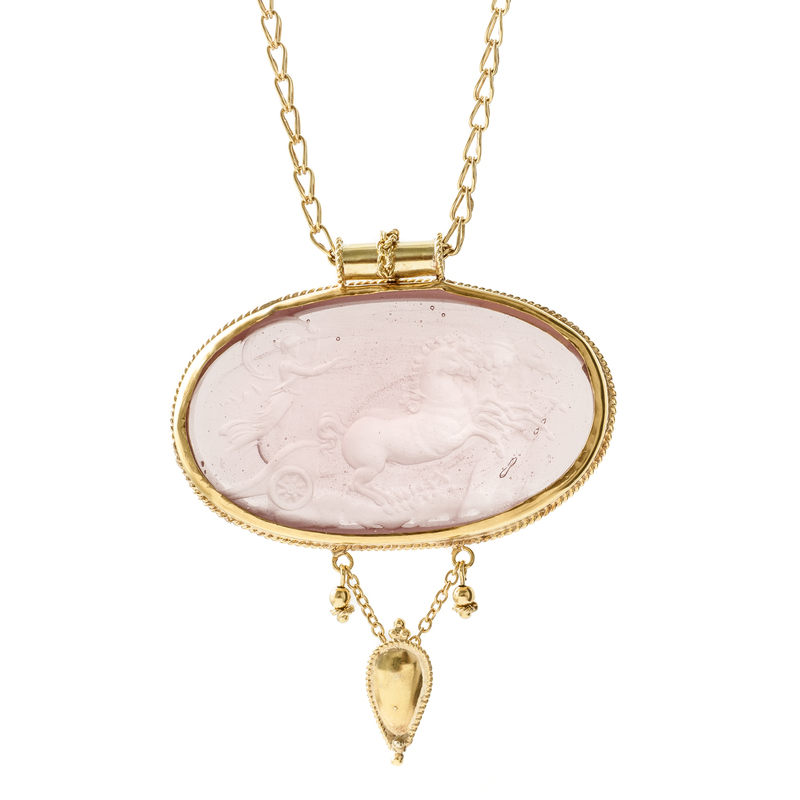 This gold necklace with a richly set oval pendant made of carved vitreous paste and with an exquisite handcrafted chain evokes precious antique jewels. This elegant original gold and coral necklace evokes an island-inspired marine world. 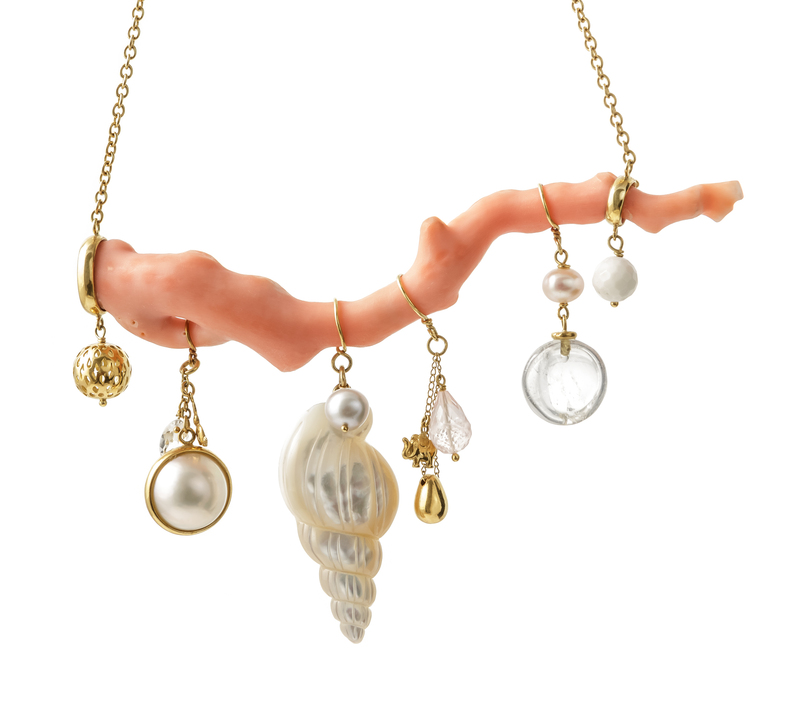 Handcrafted as a one-off piece, its distinguishing feature is a branch of pink coral that supports a harmonious composition of pendants and clusters of shells and pearls. 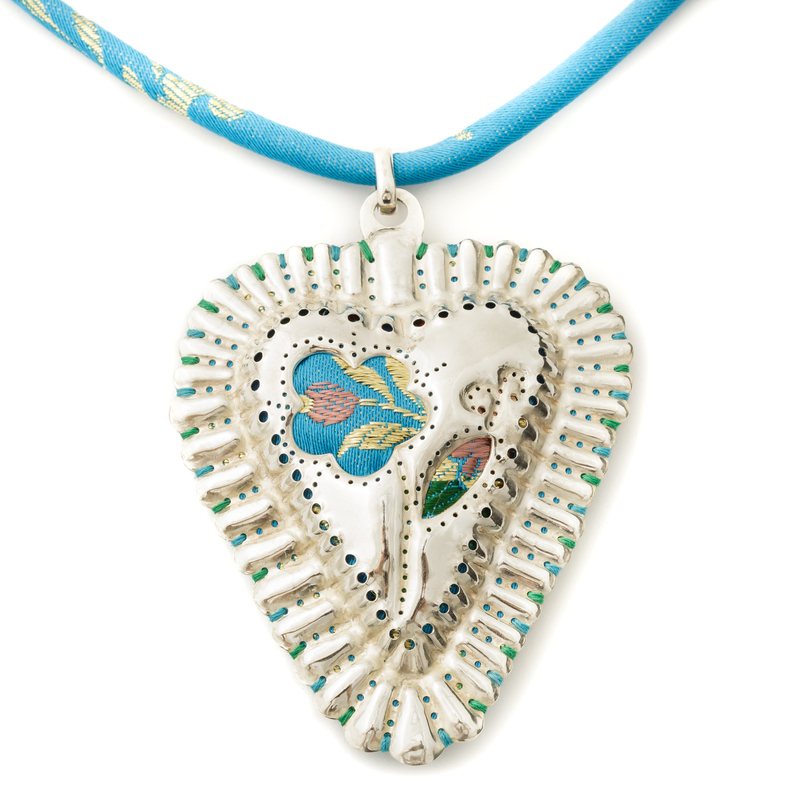 The Coriccheddos pendant is inspired by the typical heart-shaped confectionery made for festivities in the tradition of Nuoro. The jewels of the Renolfi goldsmith workshop are characterised by an accurate refined design that benefits from evident creativity and skilled craftsmanship. Vania and Beatrice Renolfi, sisters with similar artistic sensitivity and expertise in the goldsmith craft, create fine artefacts which are strongly inspired by Sardinia and its archaic culture, rituality and tradition. Vania studied as a gemstone cutter and learned the goldsmith craft working with a well-known jeweller in Nuoro. Beatrice is a GIA graduate gemmologist. In 1989 they decided to join the respective skills acquired through their different experiences and set up their own goldsmith workshop in the centre of Oristano, main town in the province with a lively and rich cultural identity, thus developing a passion and starting an activity that has lasted for almost thirty years and successfully blends skills and creative bents. Active, inspired and always keen to experiment, Beatrice and Vania participate in the island’s leading events of artisanal excellence. The Renolfi goldsmith workshop proposes several lines of jewellery with a precise exclusive design, realised according to their original goldsmith technique. Their striking collection of Phoenician jewels reinterprets the refined style and the use of gold typical of ancient jewels, combining them with vivid vitreous paste. Their most recent creation is the Memoriada collection, a wholehearted tribute to Sardinia, realised with elements and quotations inspired by the local culture, which combines traditional-style silver elements with rich floral brocades. The Fiori – Flower - line features a masterly use of gemstones, enhanced by precious combinations and gold settings. In addition to the collections currently “in progress” they also realise custom made jewellery to meet their clientele’s requests. All jewels from the Renolfi goldsmith workshop are handcrafted according to the traditional goldsmith techniques, including engraving and embossing. Gemstones are carefully selected with great competence, guaranteeing high-quality products.